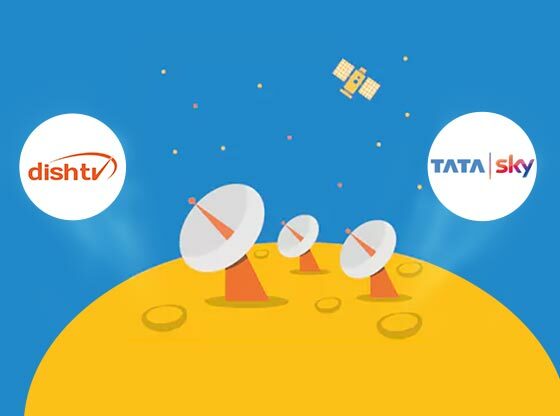 Home /DTH/How to Check Tata Sky & Dish TV Account Status and Recharge Details? Tata Sky and Dish TV are the two most popular Direct-To-Home (DTH) services in India and if you haven’t installed the first one, then you must be having the other one at your home. These two DTH market rulers impress their potential customers with their capability to meet the set of requirements every consumer have. No doubt the services offered by both of them are very satisfactory, but sometimes checking the Dish TV or Tata Sky Account balance becomes a hectic task when you don’t know the right procedure. We know how much it is important to make timely DTH recharge to enjoy uninterrupted TV experience. Thus, in this blog, we are going to discuss the ways to check the Tata Sky Balance & Dish TV Recharge and other details while sitting at home. Now, you can easily view the balance you have in the Dish TV account. Provide your registered mobile number. Now, you can easily view the Tata Sky Recharge balance, Tata Sky Subscriber ID, account due date, recharge status and monthly recharge amount on the screen. For checking your Tata Sky Account details through phone, you can give a missed call on 8880488804 from the number that you have registered on your Tata Sky account. This method is easier to get the solution of all your Tata Sky Recharge and balance related inquiries. You can even do the balance check through SMS by sending ‘BD’ from your registered mobile number to 56633. Reply would come with all the account balance details. For Dish TV online recharge details, you can give a missed call to 57575 from the registered mobile number. In just a few hours, you will get a call back from the Dish TV customer executives from whom you can ask anything. For checking Dish TV account balance through SMS, you can send your query to 57575/09250078787 through your registered mobile number. After some time, you will receive a callback and you can inquire from the executives anything you want to. Tata Sky Recharge balance could also be checked with its remote. First, you need to press the yellow button and then click the ‘Account Status’ message for viewing the account details. Dish TV allows its customers to check account balance through E-mail too; you just need to send your queries at customercare@dishtv.in. Reply will be sent to you by the professionals in a few hours. These were the best ways to keep a check on your Tata Sky or Dish TV account. For online recharge, you can visit www.talkcharge.com and even savour some striking deals, such as 150% OFF, 500% OFF and even flat Rs. 20 cash back on your first recharge. Enter the DTH number and the amount. Hit the continue button and move on the payment procedure. You are allowed to use any bank debit/credit card or you can add money into your TalkCharge e-wallet. And within a few seconds, you’d be done with your DTH Recharge. For more details, you can even talk to their customer support! Gift Cards – A New Range of Diwali Gifts!